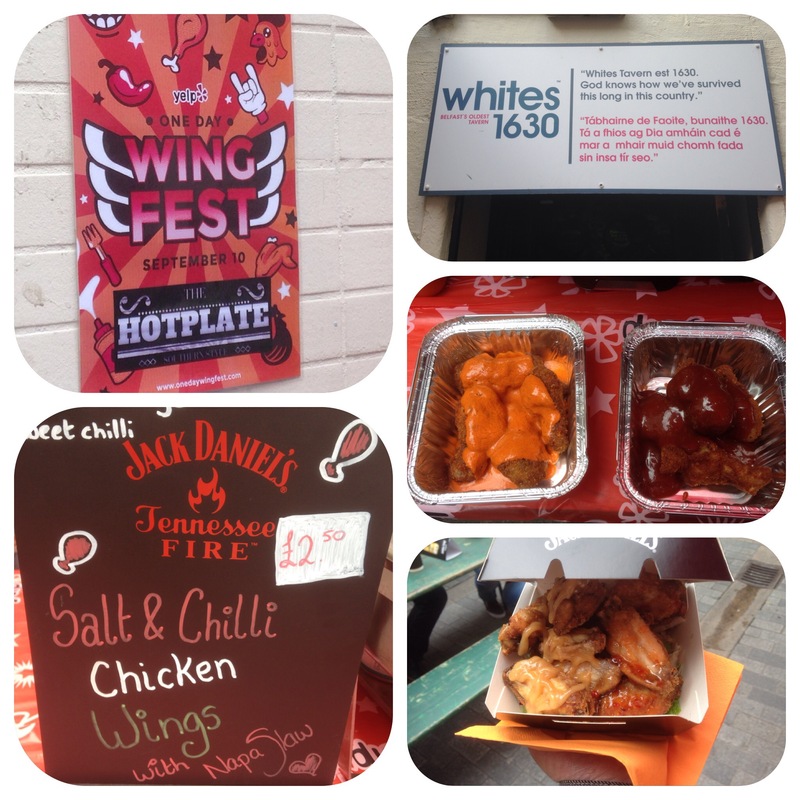 Wings wings wings, wow to the humble wing……you have your own festival and what a festival it was!!!! 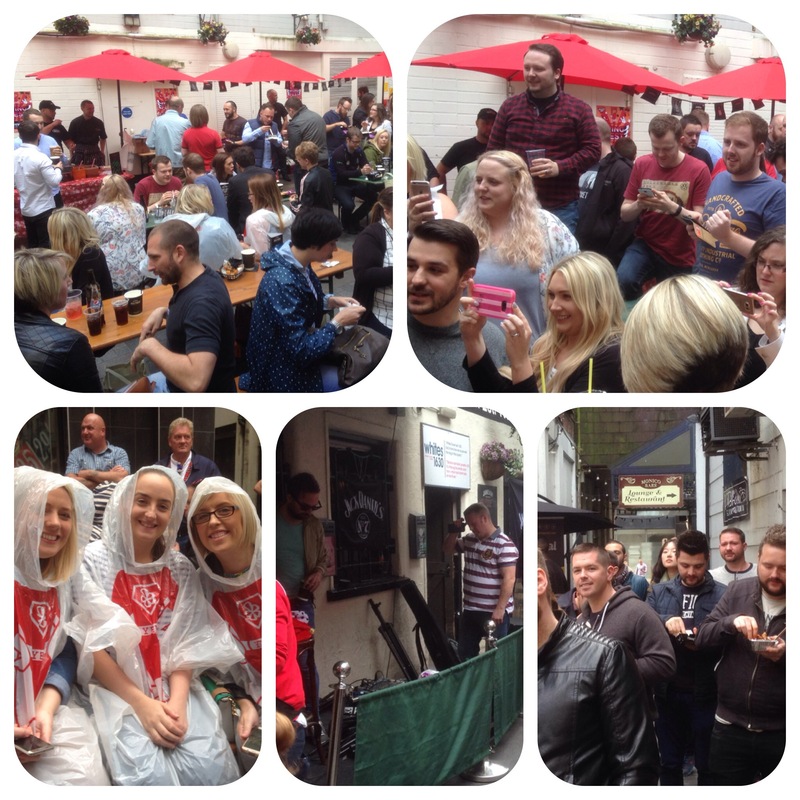 We all gathered in the courtyard in front of Vandal and Whites Tavern at around 12.30. 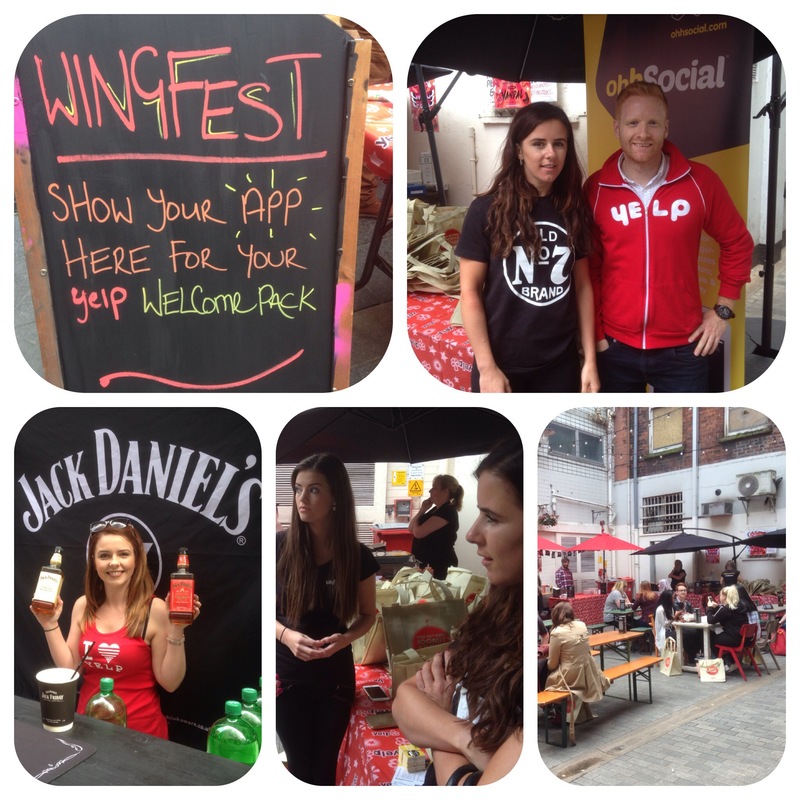 There was a drinks stall serving a complimentary Jack Daniel’s of two at one end and at the other was the Ohh Social App stand giving out our Yelp goodie bag (containing a waterproof-which thankfully we didn’t need, a nail file, a bottle opener and lip balm). There was seating in the centre of the court yard and a band at the front. Beside the band was the wing competitors table. Around the sides were stands from Hotplate Noshery, Buskers, Bubbacue and Hudson’s, Vandals wings you got inside Whites. The cost of the wings were £2.50 or a red ticket if you were an Elite-which I was!! I started with 8 breadcrumbed wings from Hotplate with two sauces BBQ and hot sauce. Then onto Buskers for 8 salt and chilli wings with peanut butter mayo and sweet chilli on Napa slaw-very nice. 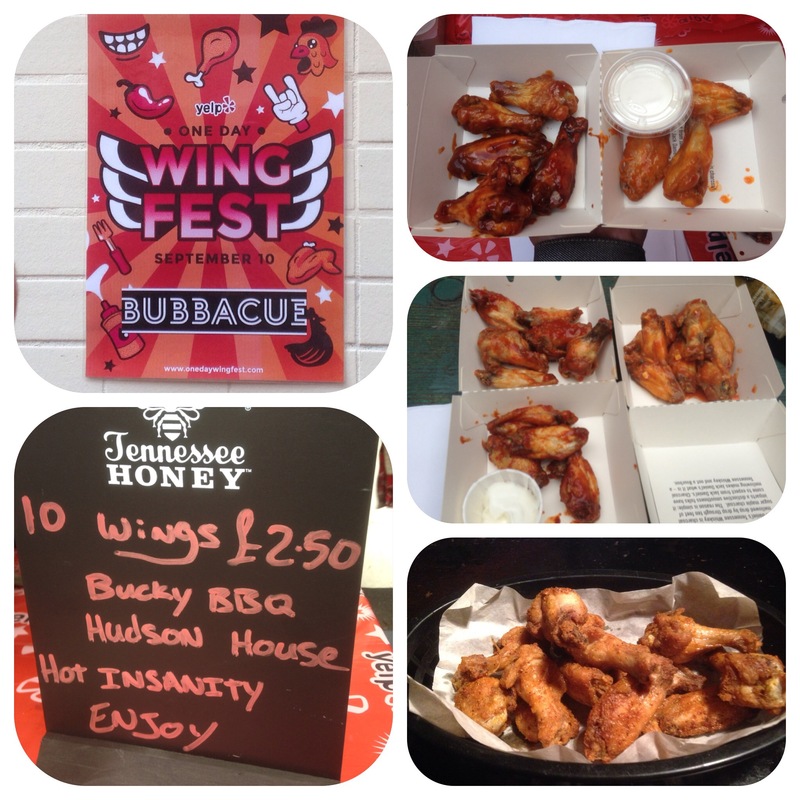 Bubbacue was next-8 wings with hot sauce, chipotle or BBQ and blue cheese dip for £2. Hudson was next- I was spoilt here I got about 16 wings with BBQ, Hudson house and hot insanity with a cooling dip. Now I love my hot sauce and the Hudson won hands down on that front!! 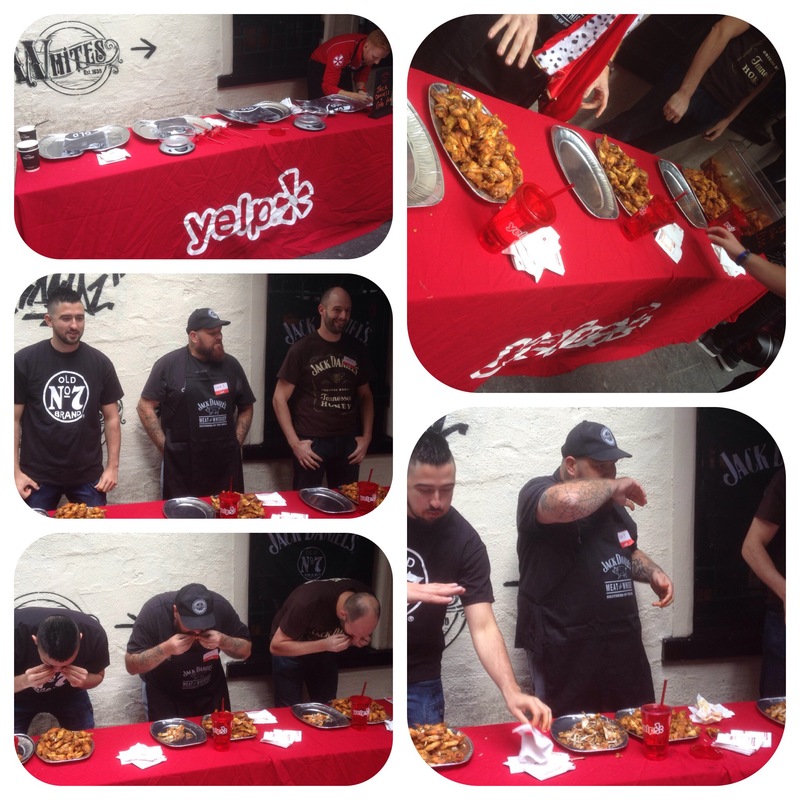 The Vandals Cajun spiced wing basket contained 14 wings and tasted great but needed a dip. My last ticket went on Hudson Hot Insanity for 10 more bad boys!!!! 64 wings later I think I’m winged out!!!! The band was fantastic and kept us entertained before the first wing eating competition. Three brave contestants stepped up to the plate or in this case tray of 2 kilo of Vandal wings and had 5 minutes to eat them. Some interesting techniques and after lots of cheering and wing munching Colm was the winner- he polished off 1.4 kg in 5 minutes!!! After this it was home to have a lie down!!!! No more wings for a while! !